Bignell Park Hotel dates back to 1740, a genteel coaching inn standing in three acres of peaceful grounds within easy reach of the M40 and the retail bargains of Bicester Shopping Village. Inside, pride of place goes to the beamed Oaks Restaurant, which is housed in a converted barn with its own impressive minstrel's gallery. The kitchen works to great-value fixed-price menus that might open with - perhaps - confit belly pork, white grape chutney and truffle jus or seared scallops with coarse gazpacho and samphire. Main courses also have a strong European bias, offering anything from breast of duck with fig compote and crispy duck leg salad to fillet of sea bass with crab and basil risotto and Parmesan oil, while desserts promise warm chocolate tart with Grand Marnier crème brûlée and bitter orange sorbet as well as strawberries and cream. A separate 'English beef' menu features hand-cut, three week-hung Hereford steaks, and Sunday lunch is a popular family event (complete with live jazz). 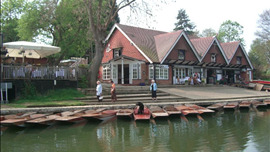 Punts tie up alongside the Cherwell Boathouse and relaxation beckons at this long-serving Oxford restaurant.